Even armchair tourists can now claim they have seen the roof of the world, as Google’s Street View project has introduced a virtual tour to one of the world’s most inaccessible places – Nepal’s Sagarmatha national park, with its glorious Everest Mountain. Google made it to the heart of the eastern Himalaya on Thursday, sharing a glimpse of what it’s like to roam the narrow and dangerous paths of the world's highest mountain, with their jaw-dropping and breath-taking views of snow-capped peaks and valleys, defined by icy blue rivers – under the care of yak-herders, listening to the traditional music played by Buddhist monks. Other remarkable sights include monasteries, schools lodges and occasional yaks. Over 45,000 panoramic images were captured over a period of two weeks by a team of backpackers, who traveled on foot to the villages of the ethnic Sherpa community with two single-lens tripod cameras and a 15-lens custom-built "Trekker" unit. The Google project was rendered possible by the cooperation with Kathmandu-based start-up “Story Cycle” and Nepalese mountaineer Apa Sherpa, a 21-time conqueror of Mount Everest and a founder of an educational charity. In his first climbing expedition to the 8,848-meter-high peak, Apa Sherpa was a porter, which is quite typical for Nepal's Sherpa community, who have long served as guides and porters on risky mountaineering expeditions. 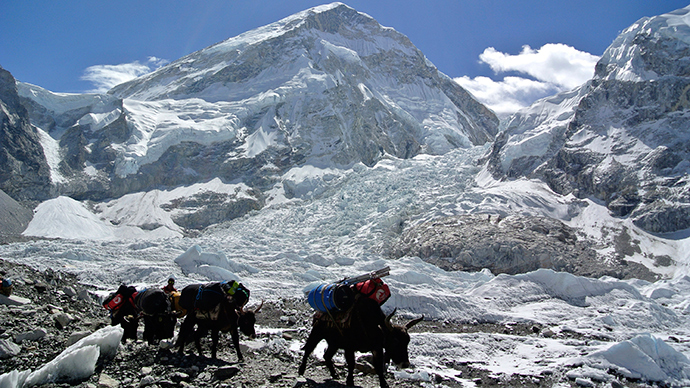 Last April alone, 16 Nepalese guides died in an avalanche, the deadliest accident on Mount Everest. Now, the Sherpas hope that the project will both promote their homeland and help raise funds for the future generations to avoid serving as the bottom line in the climbing industry. Google Street View website provides its visitors with a slideshow of 360-degree views, comprised by thousands of 75-megapixel photographs, stitched together, as well as an online map, that shows images of separate sites. “Googlers, Story Cycle employees and Apa Sherpa spent about 11 days on the move last March, using the tripod cameras and fisheye lenses to shoot inside monasteries, schools, clinics,” Raleigh Seamster, program manager for Google Earth Outreach, told AFP. Launched in 2007, Google Street View displays panoramas not only of 39 countries and about 3,000 cities, but also of the Amazon forest, Antarctica and Canada's Arctic tundra. The service offers people a chance to explore the world virtually without leaving home.